Here’s the second part of my Asian sailing odyssey in which I have a close encounter with a volcano, was mesmerised by an oil rig and learned (quickly) how to avoid collisions at sea. If you’re reading this blog for the first time, let me fill you in. 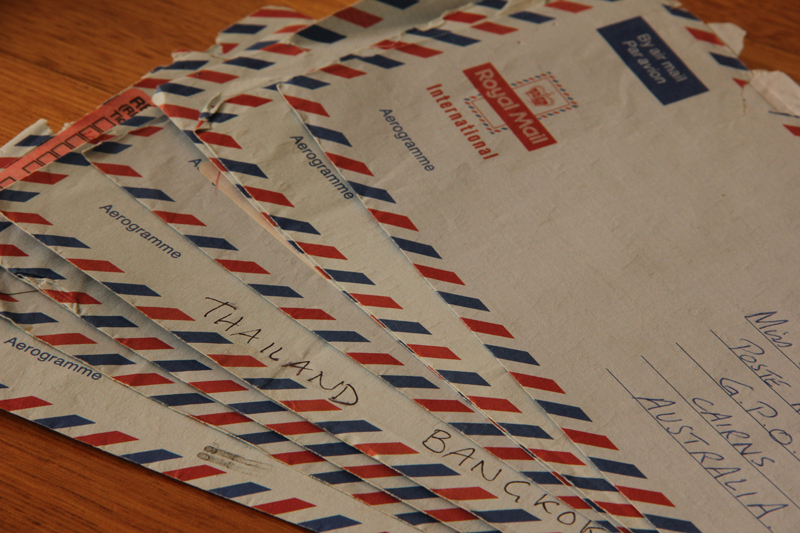 I’m recounting my travels around Asia from the early 1990s. It’s September 1993 and I’ve spent the last two months sailing from Australia through Indonesia on a 36-foot sloop. When we reached Bali I jumped ship and joined a crew of three on a beautiful 42-foot catamaran sailing to Phuket, Thailand. 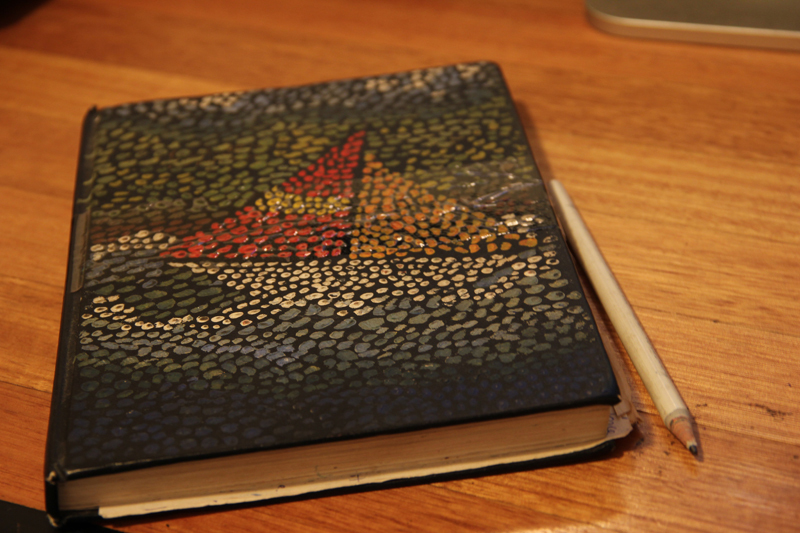 Sadly I have very few photos of this leg of my trip, but luckily I did keep a journal and a sailing log, which I recently reopened, 20 years on. Reading it is what inspired this blog. 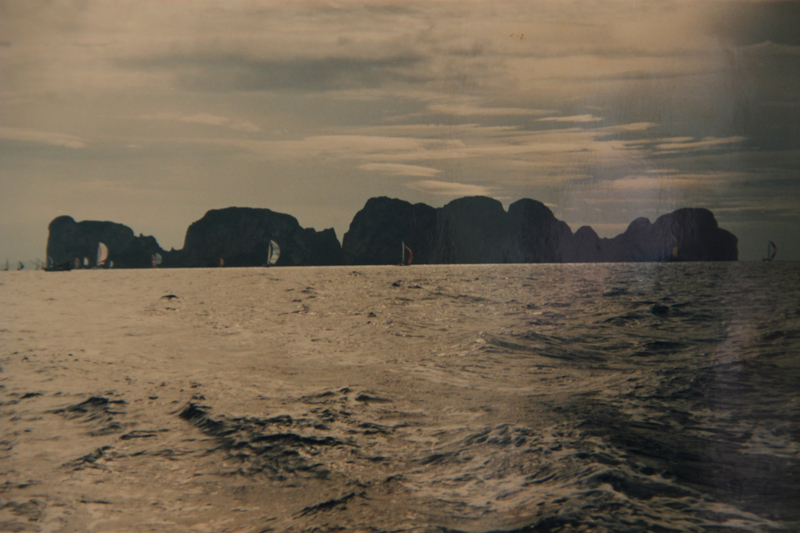 We left Bali on September 14th 1993, sailing in a westerly direction along the southern coast of Java. We needed to get to Malaysia and Thailand by certain dates to coincide with a couple of regattas, so this wasn’t a casual cruise. We were on a mission! Sailing the southern side of the archipelago was much different to the north. Here you’re exposed to the fetch from the Indian Ocean, which is why there’re so many great surfing spots along the south coast of Java and Sumatra. The swell was up, and so was the wind. Yay! After all those days in the doldrums we finally had beautiful, consistent wind. 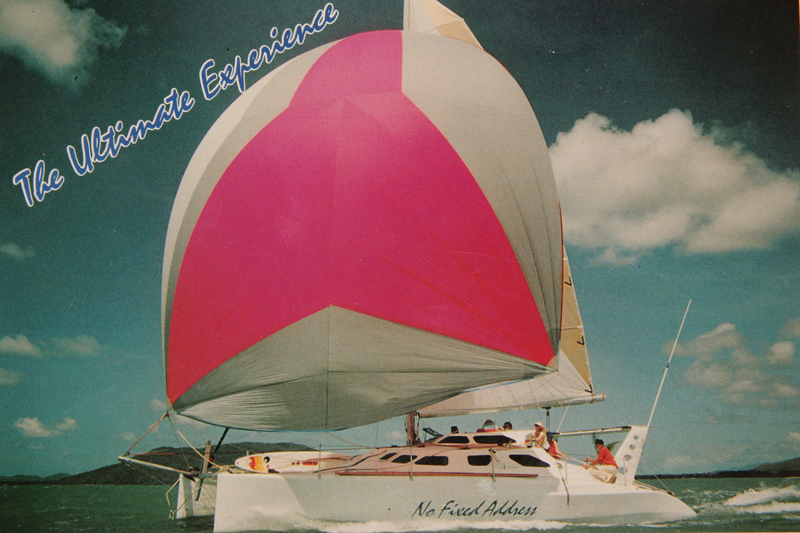 The catamaran picked up speed easily, and with a spinnaker we were flying. We did plenty of night sailing. With just two of us crew (the third person was a passenger) this offered another new experience — solo night watches. I loved it. We plotted our course with the GPS & charts and used radar to warn against rocky outcrops and ships. When you’re on your own, auto-pilot is a life-saver — enabling you to take your hands off the wheel, trim sails, check your position and scan the darkness for ships. Since we were now sailing in a shipping route the main challenges was spotting vessels at night. I learned how to monitor night lights and check whether we were on a collision course, and if so, take evasion action. In the dark it’s surprising how quickly a tanker you thought was miles away can suddenly bear down on you. Another bane of night sailing was fishing lines. Unfortunately manly local fishermen don’t mark their nets with buoys. 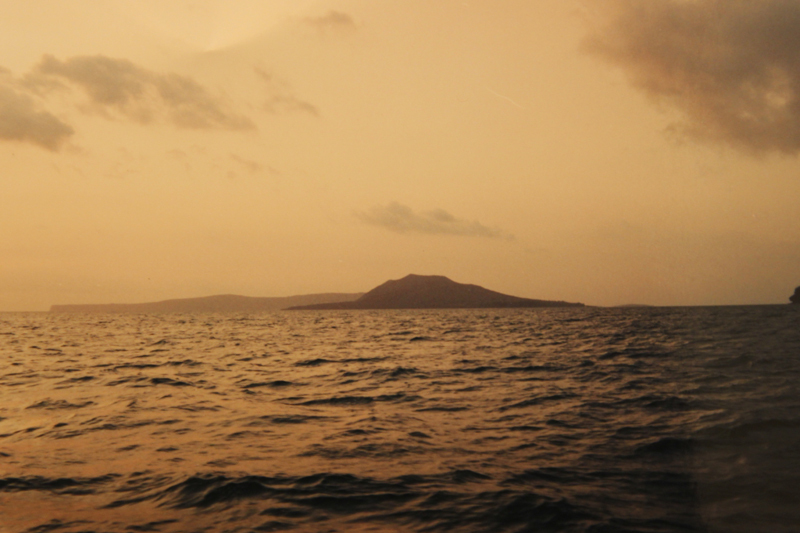 I remember one night the boat suddenly stopped in it’s tracks, the sails flapping as we ground to a halt. We quickly realised one of our centre-boards was fouled. It was impossible to see how far and in which direction the nets were laid because there were no markers. We were forced to cut ourselves free, which is pretty awful considering the fisherman probably depended on that net for his livelihood. Hopefully he could mend the tear. Anyway, faced with dealing with tankers in the channel or dealing with fishing nets closer to shore we decided to take on the tankers – as long as we stayed alert we’d be OK.
We covered the southern coast of Java pretty quickly, making only a couple of overnight nights stops – at Grajagan Bay, Pacitan Bay and then the Ujung Kulon National Park as we rounded the craggy southwest corner of Java. 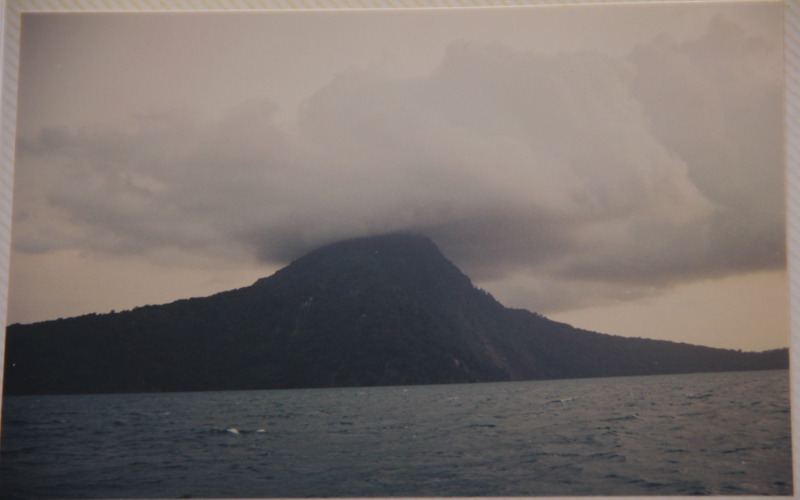 The absolute highlight was walking up to the crater of the amazing Anak Krakatau. (‘Child of Krakatoa’). It’s an active volcano that has grown up in the destroyed crater of the original Krakatoa, which was blown away in a cataclysmic eruption in 1883. First we headed to the Krakatoa museum and info centre at Cherita. The seismograph indicated the volcano was currently calm, but showed activity just two weeks prior. The skipper showed us his photos of recent eruptions. (Whoa! Glad we checked the seismo first). A few stats from the 1883 eruption: The explosion was heard over 2,000 km away, ash was thrown 80 km into the atmosphere, it triggered a 40-metre high tsunami. Some 36,000 people were killed, and 165 villages were wiped out in Sumatra and Java. That is unbelievable. Can an eruption like that happen again? Never mind, it’s time to climb! 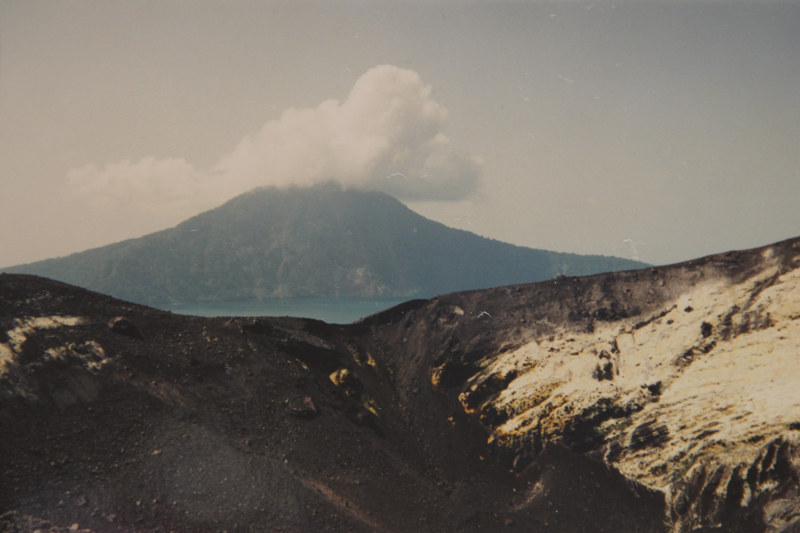 Walking up the slope of Anak Krakatau I could feel the heat under my feet and the smell of sulphur was overpowering. Peering into the crater, I was disappointed not to see a pool of bubbling magma (probably just as well) just lots of pungent smelling yellow steam oozing out of fissures. 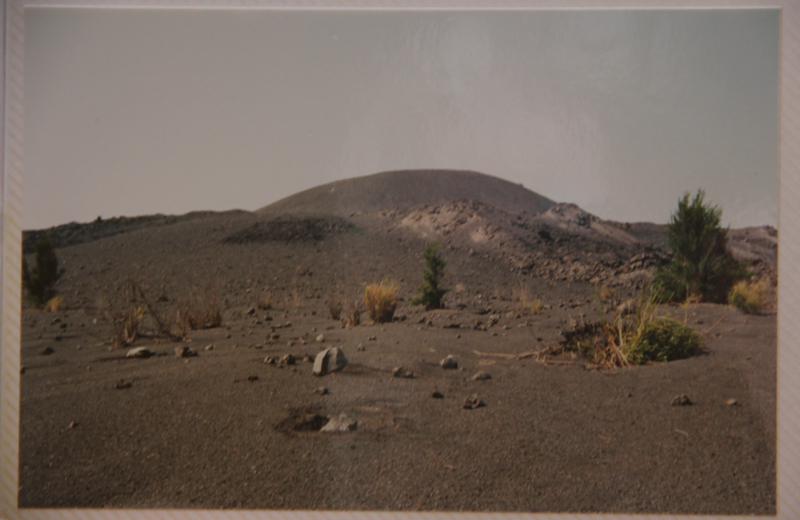 The two of us walked precariously around the steep rim of the crater. We didn’t hang around long before hot-footing it back to our dingy on the shore. 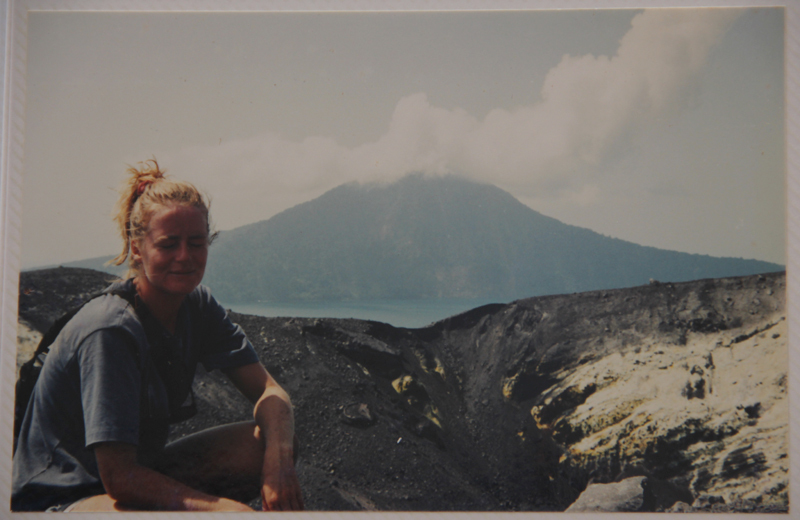 Later I found out that a Canadian woman had been killed on Anak Krakatau two months before. As her party climbed to the crater, it spewed. Apparently she died from her burns. How awful. Don’t mess with volcanoes. As we weighed anchor and journeyed northeast through the Sunda Strait I thought how surreal it was to be sailing through what was once a huge volcanic crater. Who knows what was going on in the seabed beneath us. We’d been sailing for a few days and nights straight so we were pretty tired when we squeezed through the narrowest part of the Sunda Strait between the western tip of Java and the eastern point of Sumatra. This is where two bodies of water meet and the current is strong. Adding to our woes was the constant threat of collision from endless barges, ferries, tankers and fishing boats. It was a tough slog to get through (especially with a cranky, sleep-deprived skipper). We made a small detour to Pulau Pulau Ribu, the famous ‘Thousand Islands’ — a string of about 110 reef-fringed islands in the Java Sea stretching northwards for about 45 km off the coast of Jakarta. There are a few resorts dotted around and some of the islands are private, but many are uninhabited. To be honest, I think we were too tired to appreciate the gorgeous, palm-fringed, sandy islands. On a yacht, reef = trouble. Singapore: My first impressions of this neat, efficient, ordered city-state, where people live vertically, I wrote in my journal: ‘Singapore is a fascinating place, but I’d hate to live here’ (Which is ironic because that’s exactly what I did several years later.) We stayed about a week, our passenger disembarked and the two of us continued our trip north up the Malacca Straits. 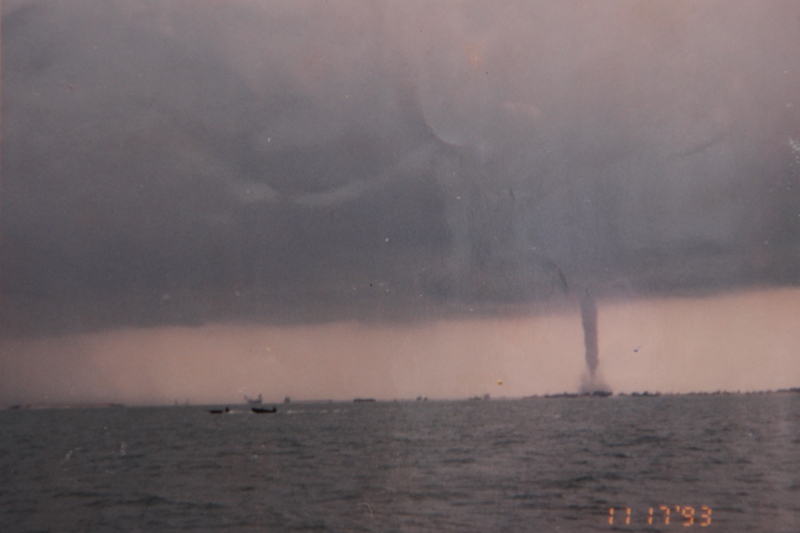 Around these latitudes squalls and even water spouts are common. This photo was taken by a friend cruising the same route, a couple of weeks ahead of us. We kept hearing that the Malacca Straits is pirate territory. Well, we didn’t encounter any. They generally target large container ships not small yachts. Not that we didn’t have our fair share of annoyances, in the form of fishing boats trawling long nets, busy marine traffic (tankers, tugs, trawlers) frequent reefs and sand banks, angry squalls, and often a frustrating lack of wind. It’s no surprise that I’ve found many references to these things in other sailing blogs, like this one. We didn’t stop much in the Straits, just calling in at Malacca, Port Klang, Penang Island and Lang Kawi. Soon enough we were in Thai waters where we had some much needed R&R, soaking up the Thai hospitality at Koh Rok Nok, Koh Phi Phi, and the magical Phra Nang. 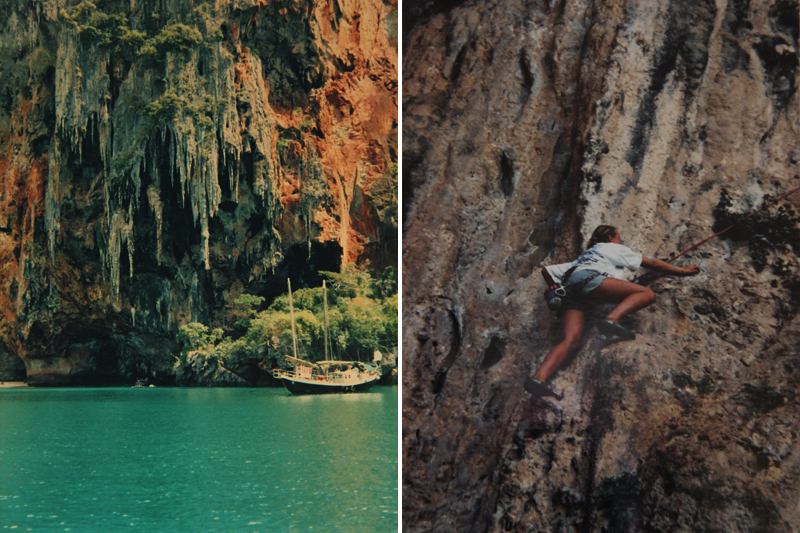 Phra Nang is where I tried rock climbing. Wow, I was hooked! Could climbing be the new sailing for me? After an exhilarating day scaling the cliffs we sailed off into the sunset towards Ao Nang bay, Phuket, which was to be our base for the next six weeks, while we cruised the area and took part in the King’s Cup Regatta. Fifty-one days after leaving Bali we anchored in Phuket. I’d learned an awful lot about sailing (and my own tolerance levels) and although I was ready to be a land-lubber for a while I wasn’t prepared to cast off my sea legs altogether and head back to England and that sensible office job.